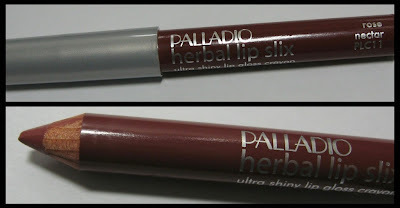 Palladio Beauty recently sent me a variety of their cosmetics to review, and today I have a look at their Herbal Lip Slix. I'll admit that while I've seen their products at Sally Beauty, I only had two of them in my stash, an eye shadow and their Rice Powder. After taking the time to learn more about their products and having had the opportunity to try a wider range of items, I know I'll be giving this brand more than a passing glance in the future. The Herbal Lip Slix in Rose Nectar is shown below in a series of different lighting (l-r: Ott lamp, natural indoor lighting, outdoors under partly cloudy skies), and this shade is an earthy rose hue with just the right amount of gloss for a natural look. The crayon type pencil allows for even application and measures 4" long and just over 3/8" in diameter (.05 oz.). Personally, I prefer a lip gloss as far as texture goes, because I generally find lip sticks and lip pencils to be more dry during both the application and wear. The Lip Slix however, is very moist and has more of a shine than other lip pencils that I've used. It's quite pigmented, and darkens with additional coats, but I was satisfied with the look of one swipe. I'd rate the longevity of the color as above average. The application of this product was much better than I'd anticipated. It's smooth and creamy, and a little product goes a long way color-wise. When I do choose to wear a lip stick or lip pencil/crayon, I feel it's necessary to top it off with a clear gloss to get the right shine factor for me. This product seems to have just the right amount of shine all by itself. It also leaves my lips feeling soft and moisturized, and because they're enriched with Aloe Vera and Vitamin E, my lips don't experience any drying. If you're looking for a glossy lip color with a natural appearance and an ultra smooth texture, check these out at Sally Beauty. They retail there for $5.99, and with the Beauty Card they're $5.39. Palladio Beauty is a cruelty-free herbal and vitamin enriched cosmetics line. *Product featured was furnished by the manufacturer or PR firm in exchange for a review.